Credit cards are so convenient to use it's easy to lose track of how much you're spending. Impulse purchases add up, and balances balloon before you know it. But big credit card balances threaten your bottom line and have far-reaching consequences. Here are three reasons to mind your spending and keep balances on your credit cards low. Keep your balances below 10 percent of your credit limits to preserve an ideal credit use ratio -- the amount of credit you use compared to your available credit. Why? The ratio is a key factor in your credit score, the rating lenders consider when deciding whether to loan you money and at what rates. The better your credit score, the better rates you get, a principle with long-term impact. You pay thousands extra in interest if you get stuck with higher rates on a 30-year mortgage, for instance. Be aware that your balances show up on your credit reports even if you pay them in full each month. Card issuers report the outstanding balances from your last billing statements to the credit reporting bureaus. Credit cards can't help you in an emergency if you've maxed out your accounts. Keep balances low so you have plenty of available credit as a safety net. In addition, build an emergency savings account so you can pay off credit cards quickly when you use them in an emergency. Money experts advise setting aside at least three to six months of living expenses to serve as a financial cushion. It's never too late to start an emergency fund. Determine how much you can set aside a month -- even just $20 a month is better than nothing -- and have the money diverted automatically from your checking to savings account to remove temptation to spend it. With average credit card rates over 16 percent, credit card debt is an expensive way to finance your lifestyle. The bigger the balances you carry from month to month, the more you pay in interest. Pay off credit card debt as quickly as possible to eliminate costly interest payments. Once you've paid down credit card debt, monitor spending closely and eliminate impulse purchases to avoid running up the balances needlessly again. 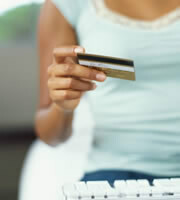 Using credit cards mindfully and in moderation helps build good credit and preserves your financial safety net. 0 Responses to "3 reasons to keep credit card balances low"